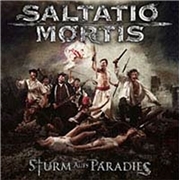 German mediaeval metal band SALTATO MORTIS has been quite successful. From humble beginnings in 2000, this combo has successfully combined their folk and metal influences and turned into a band to be counted with. Eight albums to date, and a highly successful DVD recently, sounds like more than they bargained for in the first place. They all have tongue wrecking names that are impossible to remember, perhaps the song material lingers better?